Perry Berezan scored the goal that put Calgary ahead in game 7 against Edmonton in the 1986 Stanley Cup Playoffs. You can't blame Perry Berezan if he was thinking about reading Thomas Wolfe's book "You Can't Go Home" during the 1986 Stanley Cup Playoffs. Berezan, an Edmonton, Alberta, native, happened to be playing with the Calgary Flames and became a central character in the unfolding story of Game 7 between the Flames and Oilers in the Campbell Conference Final -- which was being played in Berezan's hometown. Calgary had given Edmonton a tough time in the series, and the Oilers staved off elimination by winning Game 6 in Calgary. The teams were tied at 2-2 after 40 minutes in Game 7 when Berezan would become an unlikely hero. He would score the goal that would put Calgary ahead, except there is one crucial fact that people who just read the summary of the game would have missed. Berezan never shot a puck at Oilers goaltender Grant Fuhr. In fact, Berezan just shot the puck into the Edmonton zone and headed to the bench. Technically, Berezan never scored the goal. Oilers rookie defenseman Steve Smith, who was celebrating his 23rd birthday that April 30 night, retrieved the puck behind his net and started skating. He cut to the left of the net and fired a clearing pass that hit the back of Fuhr's left leg and bounced into the net. Berezan's "goal" came at 5:14 of the final period, giving Calgary a 3-2 lead in the third period of the seventh game on Edmonton's home ice. Berezan was credited with scoring the game-winner and, in the process, became disinherited by his fellow Edmontonians. The game-winner had come on a simple dump-in that finished Edmonton's chance at winning five straight Cups. The Oilers had won in 1984 and 1985, and with a roster filled with names like Wayne Gretzky, Mark Messier, Jari Kurri, Glenn Anderson, Paul Coffey, Kevin Lowe and Fuhr -- along with a young Esa Tikkanen and solid role players like Charlie Huddy, Craig MacTavish and the talented Andy Moog backing up Fuhr, the Oilers looked unstoppable for years to come. Edmonton could not beat Flames goalie Mike Vernon during the final 14:46 of the third period. That should have been the end of the story. But for Berezan, it wasn't. For Berezan, going home became somewhat of a problem. You see, his Edmonton neighbors didn't necessarily think it was mighty neighborly of him to sink the hometown Oilers even though he didn't put the puck in the net. Besides, there is a Calgary-Edmonton rivalry that goes beyond an ice surface. "I guess I get credit for that goal, but it was actually Steve Smith who banked it off Grant Fuhr," recalled Berezan. "All I did was dump it in and go for a change. I didn't even see what had happened. I just heard the silence of the crowd in Edmonton. "The crowd just kind of got stunned for a while, and I asked the guys what happened and they said we just scored. I said how and they said Steve Smith put it in. They didn't announce that I had scored it until about five minutes after. I had no idea that I had a part in it until they announced it." So Berezan, the Edmonton native, had scored the biggest goal in the Atlanta/Calgary Flames franchise history to that point. He didn't see the puck go into the net, was not on ice when the puck went behind Fuhr and had no idea that he would be credited with the Flames' most historic goal in the team's 14 years of existence. He was now a villain in his hometown. The Calgary-Edmonton rivalry, according to Berezan, was based on oil and which city was the better oil producer. Edmonton took the Oilers name when it started operations in the World Hockey Association in late 1971. Calgary inherited the Atlanta Flames nickname. Edmonton had a leg up on Calgary in the team name department in the two-city rivalry. "That was the biggest moment for the fans in Calgary for us to beat Edmonton," said Berezan of his goal. "That rivalry goes back way before the Edmonton Oilers-Calgary Flames. I grew up in Edmonton and it was pretty special for me to beat Edmonton because when I went to play in Calgary, (I found out) people in Edmonton hate Calgarians and people in Calgary hate Edmontonians. That's just the way it is. "And I think if you ran a friendly game of lawn bowling or something, I think there would be a couple of fists thrown if you play Edmonton and Calgary against each other." Berezan found that out in a hurry. "I took a lot of heat," Berezan said of his return to Edmonton in the summer of 1986. "My family had friends of theirs who would not talk to them after that because I happened to be on the wrong team. That gets really carried away. I had friends of mine who wouldn't exactly look at me in the same light after I scored a goal against their team. "It got a little ugly. But I loved it, because I didn't care at the time. As soon as I was traded to the Minnesota North Stars, they said, 'Okay, we can be your friend again.' That's stupid. People got to realize it's sports and real life is a separate thing. But they don't when you get into rivals between cities like that. They thought I was no threat when I was in Minnesota until we beat them in the playoffs. If Minnesota beats out their Edmonton Oilers its no big deal, but if Calgary beats out their Edmonton Oilers, yeah, they take it very seriously." "Every game with those two teams is like a playoff game. Exhibition game, regular season or playoffs, its all like playoff games for those guys." The Oilers would go on to win Cups in 1987, 1988 and 1990, taking home five championships in seven years, which is a pretty good run. But Montreal had won five straight between 1956-60 and the Canadiens and the New York Islanders also had streaks of four straight Cup years. Edmonton, Berezan noted, had a lot of swagger during their run, and that made the Flames' 1986 playoff series win even sweeter. "It was a real shock for them to lose," Berezan said. "It was one thing for us to take them to seven games in that series, but it was also another thing because Edmonton Oilers fans were extremely confident in their team, and the Edmonton Oilers at that time were extremely confident. Then, all of a sudden, their own player puts it in their own net. They shocked themselves more than anything, and I think they were in shock the whole summer wondering how they got beat out of the playoffs by the Calgary Flames. "It was strange because I don't think a lot of people, including myself, took it as I did it. When I went back to Calgary I saw people wearing Steve Smith jerseys with my number on it and stuff. Steve Smith got all the publicity for it, which he probably deserved, because I didn't have a lot to do with it except dump it in. It still is a sweet moment for me to be in that with that team when they did beat the Oilers. It was a real big moment for me." The Oilers won the Stanley Cup in 1987, and the first player to skate with the Cup after Gretzky accepted the trophy was Steve Smith. Ironically, Smith ended his career with Calgary in 2001. He was also a Flames assistant coach in 1997-98 when he sat out a season. Smith rarely spoke about his miscue. The Flames were beaten by Montreal in the 1986 Cup Final. Berezan would be traded to Minnesota in 1989 and missed out on Calgary's only Stanley Cup by a few months. He would have one more shot at the Cup in 1991, but his North Stars lost to Pittsburgh. 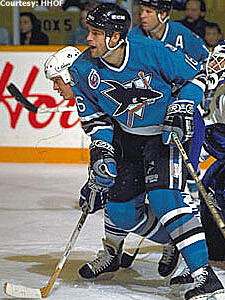 Berezan finished his career in San Jose in 1993. But Berezan may have changed the course of hockey history and prevented Edmonton from winning six or seven straight Cups by scoring a goal he never scored.